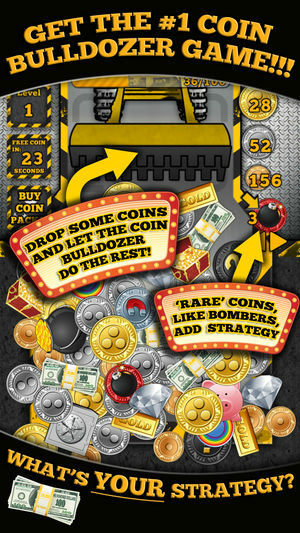 The famous carnival game ‘Coin Bulldozer’ has finally come to the iPhone and iPad, and it’s never been better! 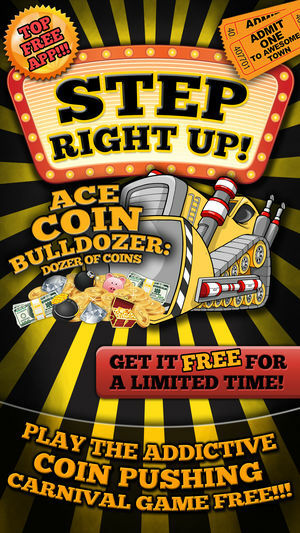 Not only are all the cool features of the original included, but Ace Coin Bulldozer adds super awesome features like “Bomb Coins” that explode after they’re placed, and “Magnet Coins,” that pull coins that would be lost otherwise, back onto the board! Cash Coins, Diamond Coins, Timer Coins, and more add a great element of strategy to what was strictly a game of chance at the carnival. 8 different coin types! More coming in an update! Earn free coins while you play or while you’re away! Sweet Notification system that shows how many coins you’ve earned on the apps badge! just like you’re email inbox for coins. Insanely cool coin booster packs, with randomly selected coins, no pack is the same!!! 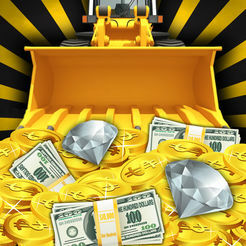 Level up to earn more free coins! Each level you gain nets you +1 to your max coin accrual amount! Universal App, push coins on iPad, iPhone and iPod!